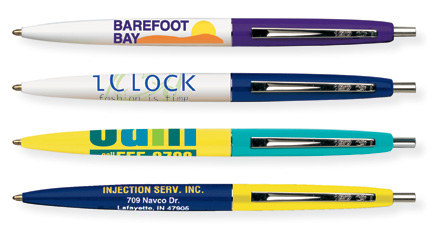 Experience a refillable, retractable ball pen. Affordable price with nickel trim. Advertise on a classy pen. Sleek and elegant. Enjoy over 1.2 miles of writing. These pens are produced using plastic made from a renewable resource. : softwood forests, harvested under a program of sustainable yield that represents environmentally responsible management of our natural resources. Imprint area for this pen: 1.5" x 1"
reference in the subject line of the email with art you are sending. 300 is the absolute minimum. These take 6 business days in production, plus 2-5day shipping time. For larger quantity pricing: EMAIL US! We ship to U.S. only. Sales tax applied to all Florida & California orders. These ship in 6 business days.